Use home pool/spa test strips. Use a liquid pool/spa test kit. Bring a sample in to your nearest pool or hot tub dealer and let them check it professionally. Take a sample of your water the same way I said in the first step. Grab a clean plastic or glass container, turn it upside down, dip it elbow-length deep as close to the middle as you can, turn it over, and collect your sample. Dip 1 test strip into the container. Compare the colors swatches on the strip to the color swatches on the bottle. Using basic test strips will only check for chlorine/bromine, pH, and alkalinity. These are really the only three things you need to worry about when using a test strip. You should test at least once or twice a week. Using the testing container that comes with the kit and take the sample the same way as above. Turn the testing container upside down, dip it elbow-length deep as close to the middle as you can, turn it over, and collect your sample. Basic liquid test kits only check for chlorine and pH. Add 4 drops of phenol red (red) to the pH side and add 4 drops of OTO (yellow) to the chlorine side. Wait about 15 seconds and compare the color of the water do the colors on the container to get your reading. Pretty simple. As with the test strips, I would recommend checking your hot tub water once or twice a week and taking it to your local hot tub dealer once a month for an in-depth analysis. I recommend that you do this at least once a month. The test strips or liquid test kit you use at home won’t be able to check for everything that your dealer can. Grab a clean 16 oz plastic or glass container to collect your water sample. If you don’t have the perfect water sample bottle, you can ask your hot tub dealer for one. Also, make sure this becomes the only water sample container that you use. Keep it clean and DON’T use it for anything else. With the container open, turn it upside down and dip it into the water about elbow-length deep. Try to collect the sample in the middle of the hot tub as best you can. Turn the container upright and start filling it up. Tighten the cap on the water sample container and take it over to your hot tub dealer immediately. Don’t let the container sit around, especially in your car during the heat. Waiting can cause inaccurate chemical readings. If you have any additional questions about testing your hot tub, please ask me in the comments below. 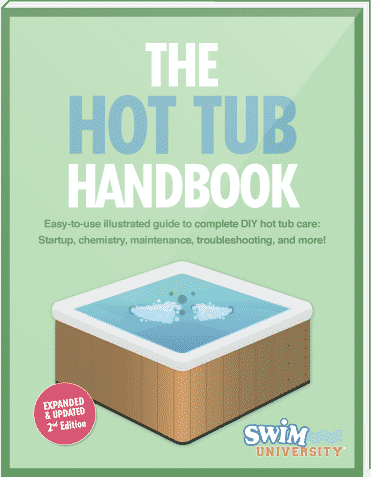 Also, if you know someone who has a hot tub and might like this article, please share it with them on any online social networks you’re a part of.